These ferries have simultaneously reversed back from the Circular Quay ferry wharves, spun around and are heading towards Sydney Harbour, passing the apartments at East Circular Quay. 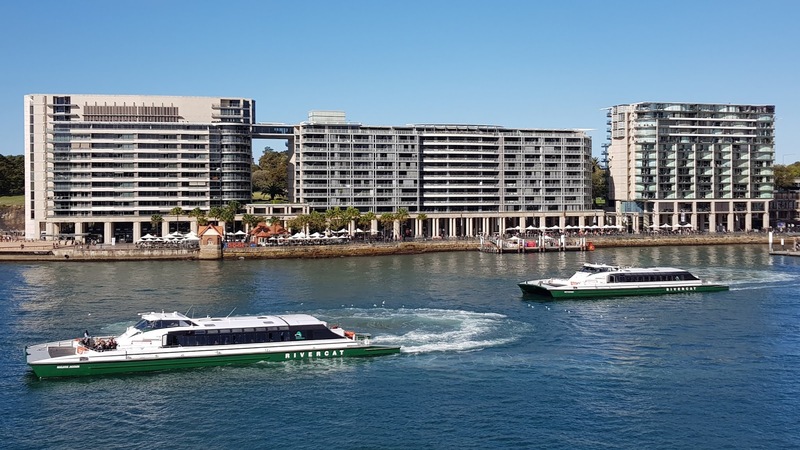 The Sydney RiverCats are a class of catamarans operated by Harbour City Ferries on the Parramatta River from Circular Quay to Parramatta. faint reflections - took me a minute to see them! Yes, the wake from the boats spinning around, broke the surface of the water. The reflections were more prominent beforehand. Funny building facade in the background Jim. Hello, pretty view of the ferries. Enjoy your day and week ahead!